19th century hand-drawn whimsical map. 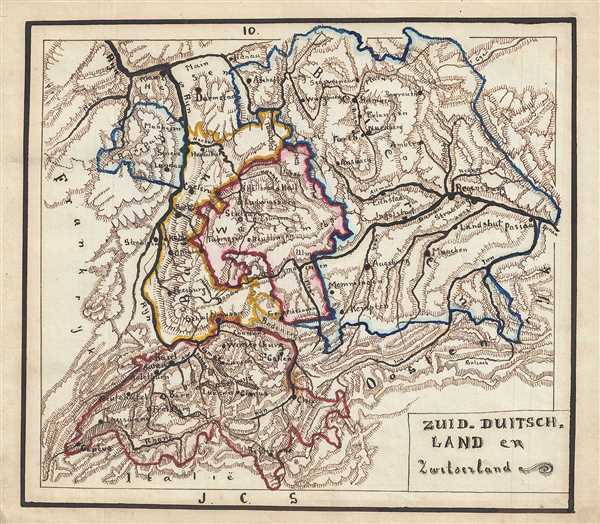 This is a lovely 1871 manuscript map of Switzerland and Southern Germany by J. C. Sikkel. It cover Germany from Mainz (Mayne or Maine) south to include all of Switzerland and depict the semi-autonomous kingdoms, duchies and Prussian territories of southern Germany. These include Bavaria, Baden, and Wurttemberg (Wirtemberg). Territories are color coded and topography is beautifully rendered throughout. Important towns, cities, and provinces are noted throughout. The Congress of Vienna in 1815 created The German Confederation to coordinate the economies of the separate but culturally related German-speaking countries. It briefly dissolved during the Revolution of 1948, but was re-established in 1850. Nonetheless the rivalry between the two powerful states increased until it finally broke out into the Austro-Prussian War. Prussia won the Austro-Prussian War in 1866 which ultimately led to the collapse of the German Confederation. A few years later, in 1871, most of the former Confederation states were folded into the newly proclaimed German Empire. Features wonderful and whimsical overall presentation. This map was drawn in 1871 by J.C. Sikkel as part of Der Atlas Geheele Aarde.